Dogs in coats trot along a stretch of trail just south of Alaska Pacific University in east Anchorage. The dog at the left front is also wearing booties. 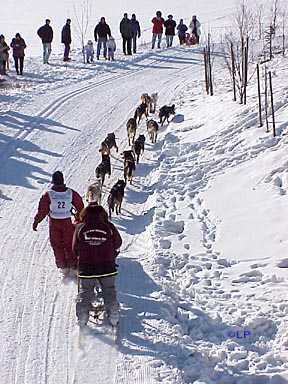 The musher is Christopher Knott, who was in 20th place as the race neared its end. 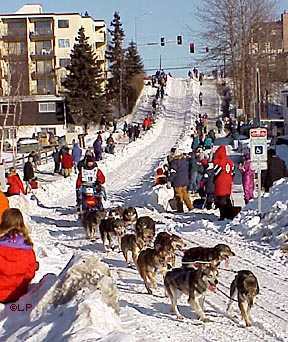 Peryll Kyzer's dog sled team comes down the Cordova Street hill, a mile south of downtown Anchorage. A week later and 800 miles into the race, she was in 21st place in the 1999 Iditarod as teams raced along the Yukon River. The Cordova Street hill is the steepest descent in the first-day run through Anchorage, but less of a challenge for the mushers and their teams than the ones they later found in the wilderness. The temperature was in the 20s as the teams raced down snow-covered streets in town on Saturday, March 6. However, a -75 degree windchill stopped DeeDee Jonrowe, one of the pre-race favorites (she'd finished in second place the year before), the following Saturday. She was forced to scratch when her dogs refused to continue along the Yukon River in the face of -35 degree temperatures and a 20-mile-per-hour headwind. Forty of the original 56 mushers were still racing for Nome on March 18. Eight had already arrived there and eight, including Jonrowe, had scratched. The eventual winner was Doug Swingley, who completed the race in 9 days, 14 hours and 31 minutes. It was the first of three consecutive Iditarod wins for him. Peryll Kyzer finished in 29th place. She has run in the Iditarod 10 times through 2006. A ninth-place finish in 1997 was her best. Musher Aaron Burmeister's team has just come out from under a street overpass in East Anchorage. Burmeister, who is from Nome, was racing in his third Iditarod. Seven days into the race he was in 35th place. He finished in 39th place. The Anchorage leg of the race took the teams on streets from downtown to the city's trail system about a mile and a half away. From then on, the trail followed creeks and ran through woods -- only occasionally marred by urban touches such as tunnels under highways. At two places along the route, the teams had to take bicycle overpasses over major roads. 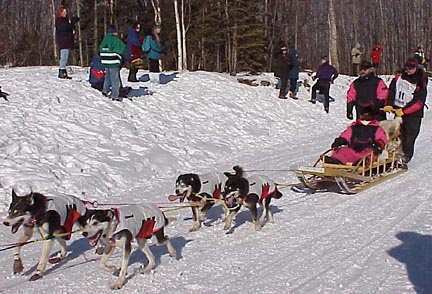 The start of the 1996 Iditarod.